There was a lot of PDA on Main Street Plaza this morning, but no one was detained, arrested, removed or even asked to leave. 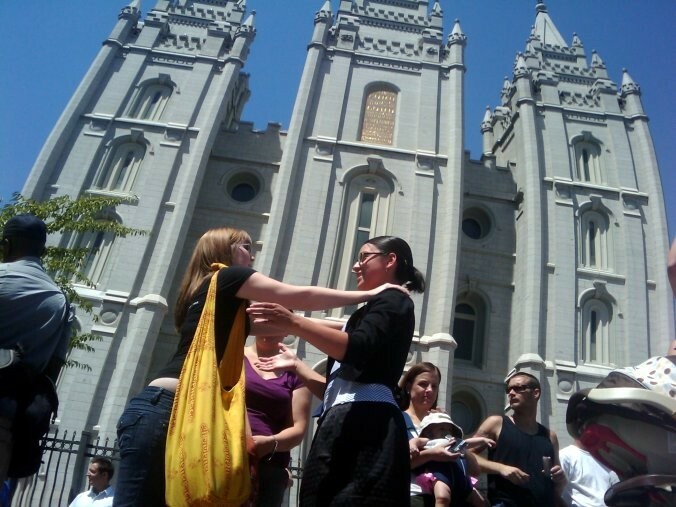 Of course, the demonstration was to protest the church's detention of two gay guys kissing on Main Street Plaza. Between the kissing and the 90-degree heat, that was certainly the hottest demonstration I've ever been to. Salt Lake City's Rick LaPointe and David Alder said in front of the LDS Temple they were ready to quit the church, officially. "We thought we'd come hand in our Temple recommends," LaPointe said. For non-Mormons or non-Utahns who may not know, a Temple recommend is one's license to enter the super-secret structure. Not even all Mormons have a Temple recommend. If you have a Temple recommend and you foul up, like if you avow homosexuality, the chruch takes it away. "I think I rolled mine up and smoked it," Alder said. A very hot-looking Lauren McChesney had a gas mask in case police "want to bring it on" but lucky for her there were only 3 officers for most of the demonstration, five by the end. But she was ready to battle, it seemed. "I'm chained in here. They would have to hurt me to get me out of here," McChesney said. In the picture below, she's actually on public property, but later moved onto what, I think, is church property right next to the fountain on South Temple. She said "signs of affection" shouldn't be against the laws or rules anywhere. Counter protesters from America Forever, the gaggle of Brazilians (and others?) who can be counted on to show at these sorts of things, held gigantic signs, much bigger than the actual protesters' signs. Well done, AF. There were probably about 10 of them. WARNING: unscientific crowd count ahead. At precisely 12:36 p.m., I head-counted 154 people around the reflection pool and from where I was standing, I could see at least 30 to 50 people back on the tiny little piece of Main St. Plaza that remains public. Take that for what its worth, but since the crowd-count numbers became an issue last week, I thought I should offer my own. By the way, I don't count crowds unless I actually count them. SLCPD said there were no arrests or citations. One person affiliated with America Forever said she received an unwelcome kiss and bear hug from behind. The complaintant refused to give her name, but a woman who identified as the complaintant's sister was Alissa Rodrigues. Rodrigues said her aunt, a different woman, was also crashed into by a rollerblader and was in an ambulance receiving medical attention. No word on motive or intentionality on that crash. Rodrigues said the rollerblader rolled away. Lt. Cal Kunz of SLCPD said he was aware of the suspected rollerblade "assault," but the woman was not transported to the hospital. He said he was unaware of the unwelcome kiss that Rodrigues told me about. Are you out of the loop? Follow me twitter.com/fruhwirth . Planning your own demonstration? E-mail me at jfruhwirth@cityweekly.net .